The “Lemmer” Vogelzangs move to Amsterdam, and surroundings. 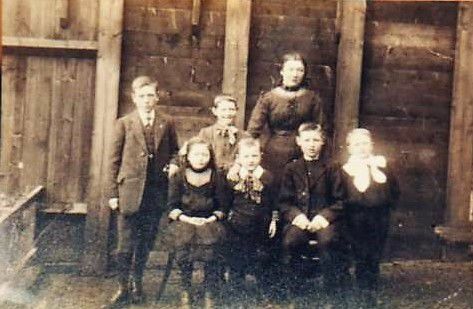 The Vogelzang kids around 1912. Front row: Engeline, Ruurd, Albertus and Lubertus. Back row: Rintje, Johannes and Agatha. The seven Vogelzang brothers: Standing from l to r Ruurd, Albertus, Jo, and Lubertus. Seated l to r :Rintje, Herman, Weird. Picture taken around 1926. 1. Hermanus (Harmen) Vogelzang, born in Lemmer on Mar 28, 1895. He died in Sneek in the Lelanen Seniors Home on Oct. 12, 1985. He married in Amsterdam on Apr. 6, 1921 Veronica (Froukje) Adringa. She was born in Woudsend on Mar 28, 1898. She died in Sneek in the same senior’s home on Sep 7, 1987. He was a tool and die maker by trade. 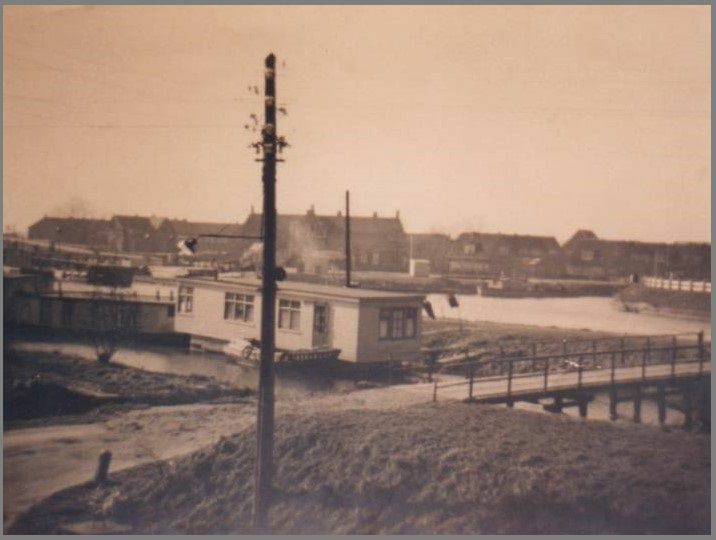 During most of their married years and while he was working at the Amsterdam Dry Docks Copmpany, they lived at Niewendam- on the east side of the outskirts of Amsterdam. He was a skilled and clever man. The couple had six children. It was customary for the Vogelzangs to get together on birthdays, of the brothers in particular. During these events they would reminisce about their years as teens in Lemmer where they grew up. Particularly after the men had a few glasses of dutch gin (jenever) and the ladies egg nog with whipped cream (advocaat) they got quite happy and would interrupt the festivities with various birthday songs. The would usually break up around 11.00 p.m.after which they went back home. Since Herman lived somewhat outside the city, he was not able to use public transportation. Hence he and his wife would arrive on their medium size motorbike. She would be all done up in leathers, including leather pants-a relative rarity for women to wear in those days. The boys even though they liked Herman, used to make fun of him and his wife, which tended to bother him. As a result he tended to shun the birthday gatherings, till the boys put pressure on him to show up, at which time he would appear again, bike and all. On one of the last occasions of this, Rintje’s birthday, they had gone through their celebrations and Herman and wife Froukje donned their leathers and mounted their bike She was a relatively stout lady and climbed on the bike’s back seat for her ride home. Herman, being a typical Vogelzang, always in a hurry and probably a bit up tight about the ribbing he had taken that evening, gunned the bike and took off like a shot. The bike shot forward, dumping Froukje on the street where she sat like a doll in the middle of the roadway while Herman disappeared. After he had driven about a block, he noticed that his bike felt kind of light. He looked back and saw his wife missing. Hence he returned to his point of departure where Froukje was still sitting upright and dazed in the middle of the street. Guessed who laughed, who got a scolding and who from that point ceased attending the birthday parties? Picture of the Vogelzang clan, taken on the 25th wedding anniversary of Herman and Froukje. 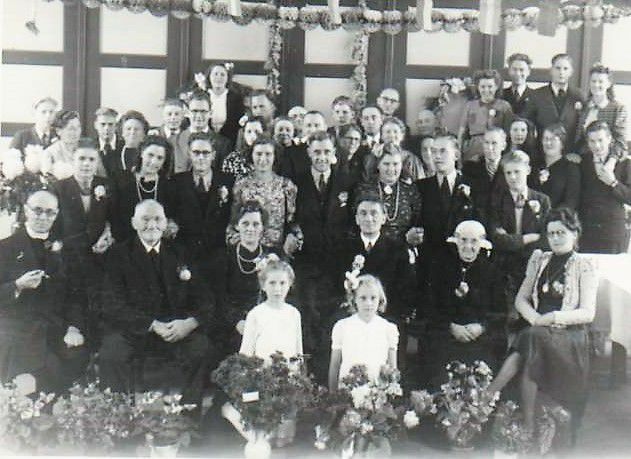 Front row standing up: Ria Zaman and An Vogelzang; Sitting l to r. “Heerneef” father Wierdsma from Antwerp, Grandfather Jan Vogelzang, Froukje and Herman, Froukje’s mother in her traditional Frisian dress and Froukje’s sister Anne.first standing row l to r: son Kees Vogelzang ?, son Jan, Lidwina and Harry, Maria and Rein, Willem; second and third standing row: ?, Agatha Deden-Vogelzang, Weird Vogelzang and his wife Anne, ?,?, Leida Vogelzang-Peelen,?, Lubertus Vogelzang, Theo Vogelzang (Albertus’ son) and his mother Lena Vogelzang, G. Kloosterman and his wife Engeline Kloosterman-Vogelzang, Ruurd Vogelzang, ?,?,Johannes Deden and daughter Reinalda (Rennie),?,? ; Final back row:?, Greet Vogelzang-Kost, ?, Willem Lutmer and wife Thea Deden. 2. Agatha Vogelzang, born in Lemmer Sep 19, 1896. She died in Bakhuizen on March 20, .1976. 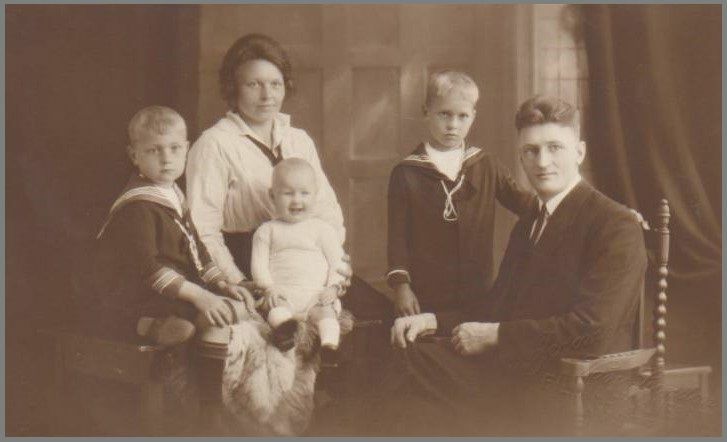 She married on Jun 20, 1924 Johannes Deden who was born in Bakhuizen April 22, 1896. He died there on Nov 26, 1979. Johannes was “Parlevinker” and lived in Breukelen in a house boat along the Merwede canal, the main water way between Amsterdam and Rotterdam. “Parlevinker” is a person who has a small motor boat carrying groceries and house wares, selling almost anything that the skippers passing through the canal may need- something like a peddler by boat. The couple had four children. 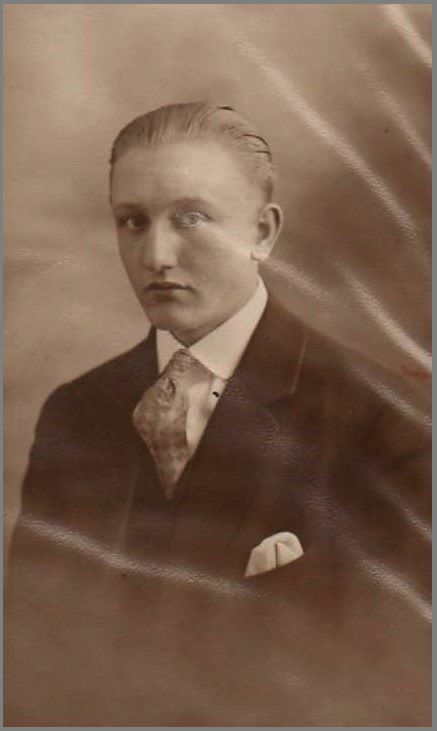 After the war, when the great Dutch migration was on, the family sold everything and moved to the Chicago area where Johannes Deden had family involved in brick laying. He stayed there for a few years, but found it difficult to make the transition. Hence they and their youngest two children returned to Holland and retired in Friesland again, after first running a small general store in Hamersveld. Johannes Deden about 1920 en Courting picture of Johannes and Agatha. When Agatha’s mother took sick and ended up in the hospital on numerous times, and since her father was still at sea, she being the oldest, ended up looking after her seven younger brothers, who were a bit of a handful. This affected her nerves for all of her life. To calm them she would smoke the odd cigar or chew tobacco. Like her mother she got breast cancer, but a double mastectomy prevented it from spreading. She used to make fun of her operation. Johannes Deden was short of stature. She used to call him in Frisian “lietche manschen”- my little boy. 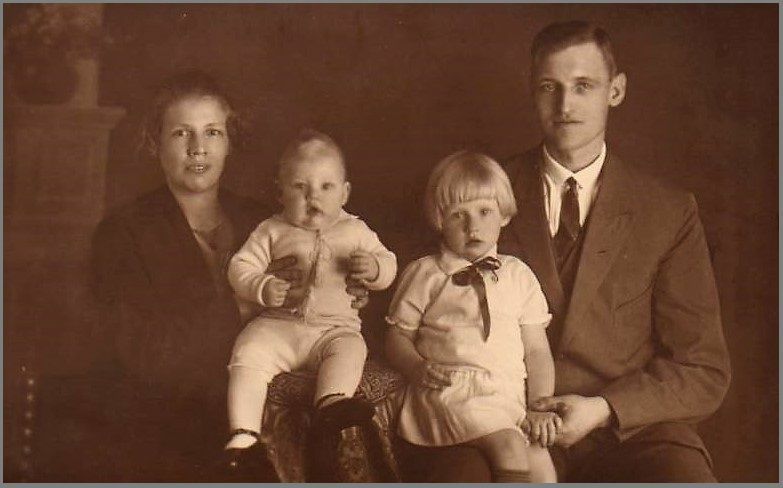 Johannes Deden and Agatha Vogelzang with their first child Thea-fall of 1925. The Deden family in front of their house boat in Breukelen around 1934. 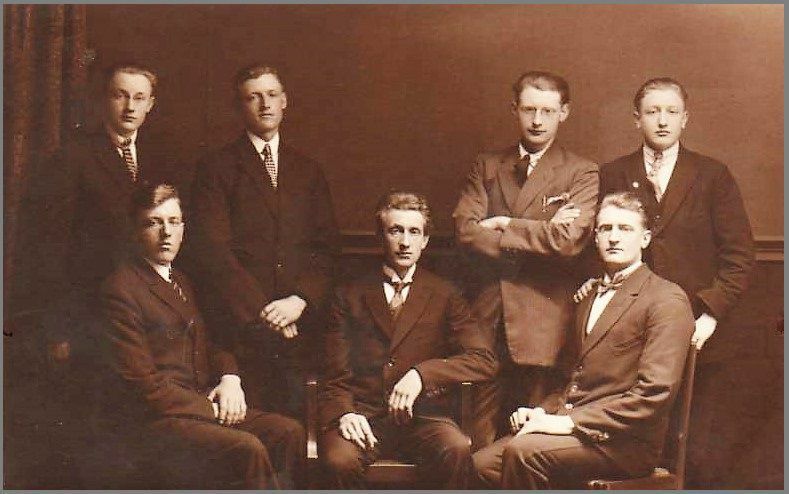 Back row: Rennie, Agatha and Johannes Deden; front Jan and Thea. Next row: Jan Deden, Johannes Deden, Rennie M. v d Sman-Vogelzang, Agatha Deden-Vogelzang, Engeline Kloosterman-Vogelzang, Cornelis Buurman and Rennie Deden. 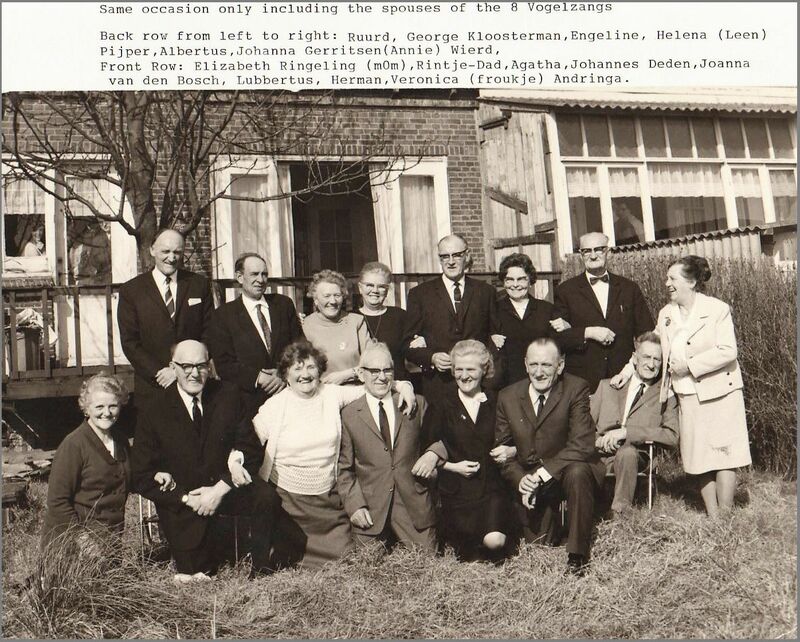 Standing in next row: Mr. Buurman sr.?, Leen Pijper-Vogelzang, Froukje Vogelzang , Leida Peelen-Vogelzang, Elizabeth Ringeling-Vogelzang, AnnieGerresen-Vogelzang, Willem and Thea Lutmer and their son Jan, Jan Deden; next half row: Herman Vogelzang, Lubertus Vogelzang, and Wierd Vogelzang; Final row: G Kloosterman, Rintje Vogelzang, Greet Vogelzang, Lubertus’ daughter?, Greet Vogelzang-Kost, Albertus Vogelzang, ?, Jan Lubertus’ son. Deden’s houseboat with in front of it the small motor boat from which he sold his wares. 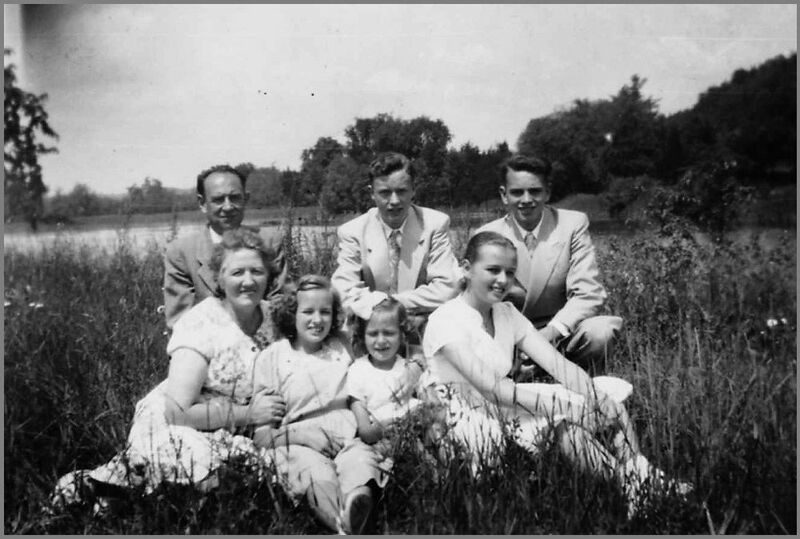 Deden Family when they emigrated to the States- Chicago area- about 1947. 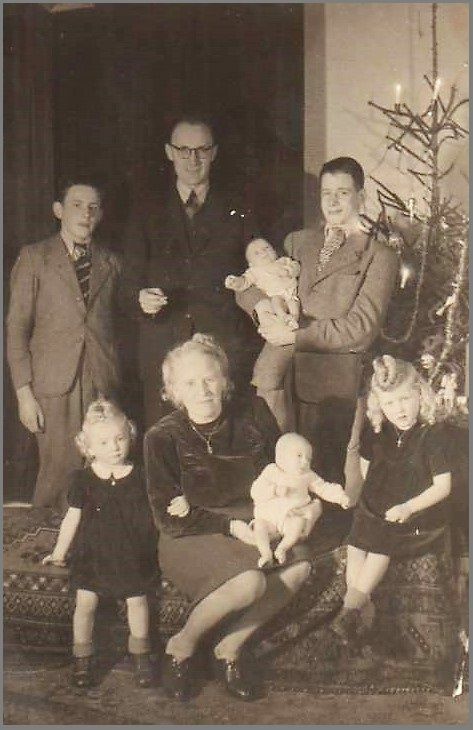 L to r: Agatha; Louis; Johannes Deden; his brother; Willem Lutmer and Thea; Jan.
3. Weird Vogelzang, born in Lemmer on Oct 2, 1898 and died in the hospital in Haarlem on Aug 25, 1977 of lung cancer. 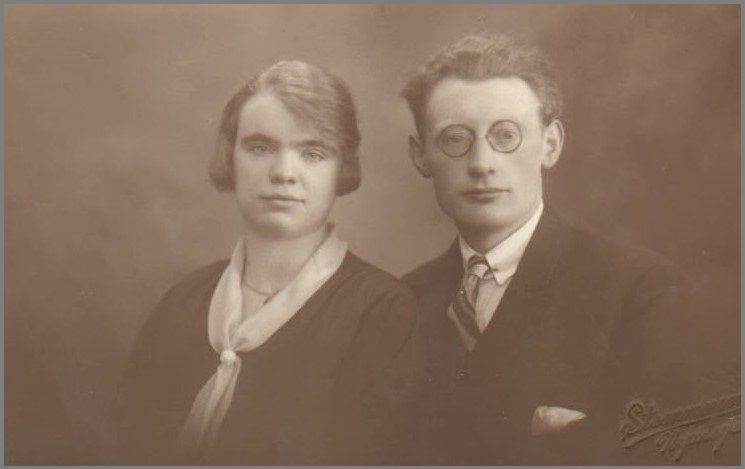 He married the widow of Johannes Pakkoo, Anna Jacoba Hendrika Gerresen, who was born in Arnhem on Sep 22, 1896 in the St Willibrord church in Amsterdam on Nov 9, 1922 She died in Zwanenburg/Halfweg on Jun 8, 1975-choked to death. She and her first husband had moved to Indonesia in 1914. He died while playing soccer, aggravated by a bout with malaria. She and her two children from this marriage stayed in Indonesia till the war was ended and then returned to Holland. The second marriage produced four children. 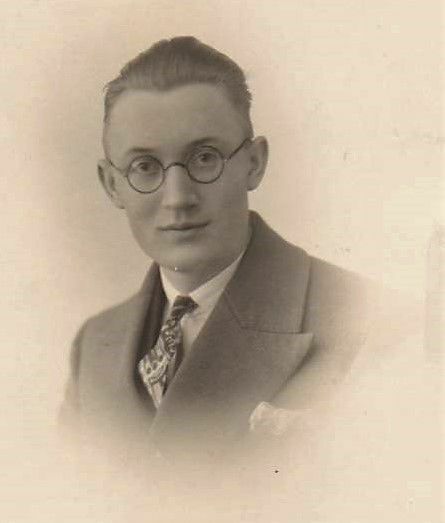 Weird was a stationary engineer at the Western Sugar Refinery in Amsterdam and was instrumental in Rintje getting a job there in the same section, following the end of the 2nd world war. Anne was quite deaf. Weird and Anne Vogelzang’s family Sep 1924. From l to r Adde Pakkoo, Anne, Jan Vogelzang, Joop Pakkoo and Wierd Vogelzang. 4. Rintje Vogelzang, born at Lemmer Jul. 2, 1900. 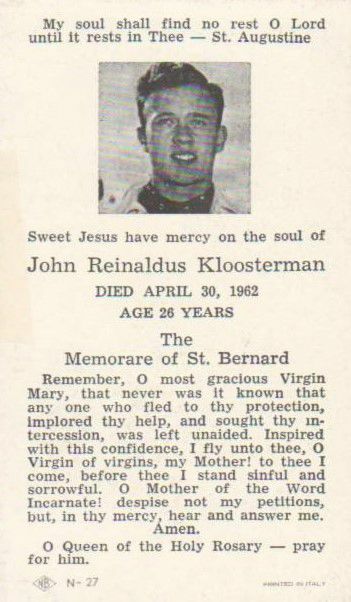 He died in Amsterdam in the St.Jacob’s Seniors home on Feb 11, 1987. On April 26, 1930 he married Elizabeth Alida Ringeling, who was born on Oct 31, 1902 in Rotterdam. They married in the St. Anthony of Padua Church in Rotterdam. More about them in the next chapter. 5. Albertus Vogelzang, born in Lemmer on Sep. 20, 1901 and died in Amsterdam on Sep. 18, 1970 of cancer. He was tool maker by profession. He married on Oct. 16, 1925 at Dokkum Helena(Leen) Pijper, the daughter of Theodorus Bernardus Pijper who was born on Sep. 30, 1853 at Rinsumageest an died there on Nov. 26,1936. He was married to Johanna Johannes Brunink who was born at Zwaagwesteind on Oct. 23, 1858 and died at Rinsumageest on Jan. 14, 1941.Helena died in Amsterdam on Jan. 23, 1981.She was one of the most warmhearted ladies one could ever meet. Not flustered by almost anything, an ideal mother of her twelve kids. 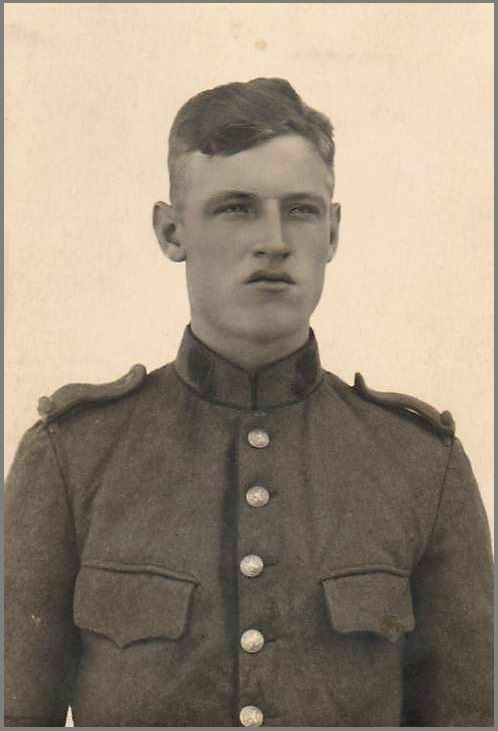 Albertus Vogelzang, as conscript in Dutch army, about 1919. 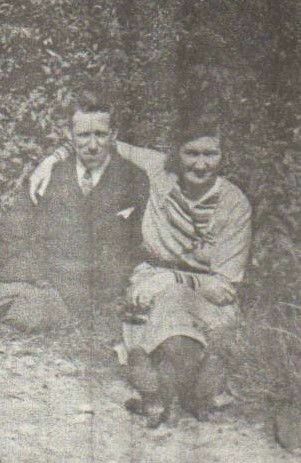 Albertus Vogelzang, and Helena Pijper as engaged couple, about 1925. 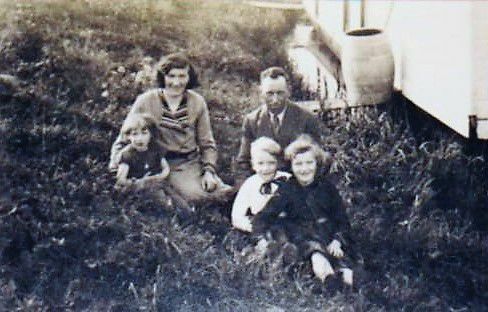 Albertus Vogelzang and Helena Vogelzang-Pijper, ca 1929, with their children: Theo and Reinalda. 6. 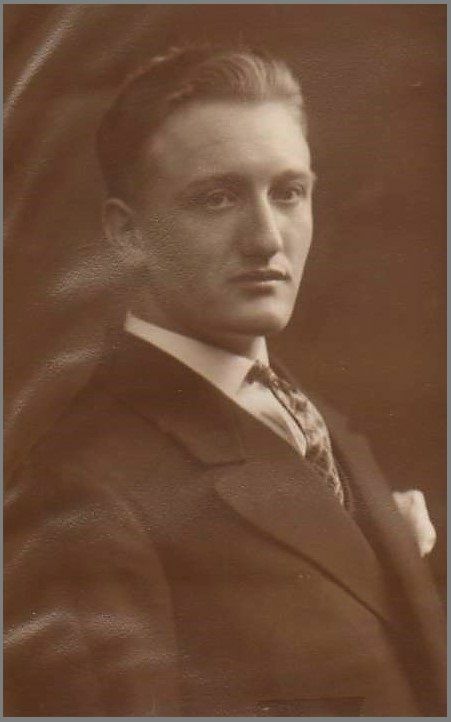 Johannes (Joe) Vogelzang, born in Lemmer on Aug 28, 1903 and died in Capetown, South Africa on Nov 3, 1960. He died of lung cancer. 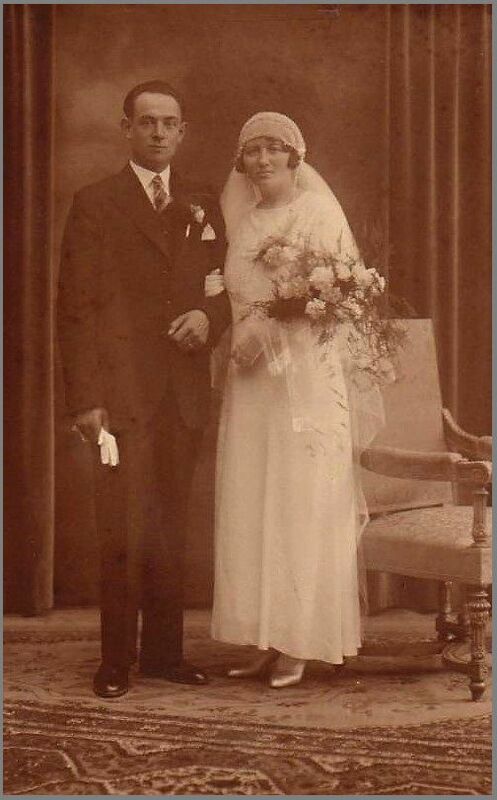 On Dec 28, 1929 he married in Nijmegen Johanna Theodora Kropman. She was born in Nijmegen on Jun 2, 1905. She Died in Port Elizabeth, SA, on Nov 5, 1972. They had four children. Around 1939, they emigrated to South Africa where Jo became a prominent contractor in the Capetown area. His oldest son joined him in the business. They miscalculated the cost of building a large church causing him to go bankrupt. It broke his spirit and he died shortly after this. Johannes (Joe) Vogelzang. Dec 1922. & Johannes (Joe) Vogelzang, about 1926. 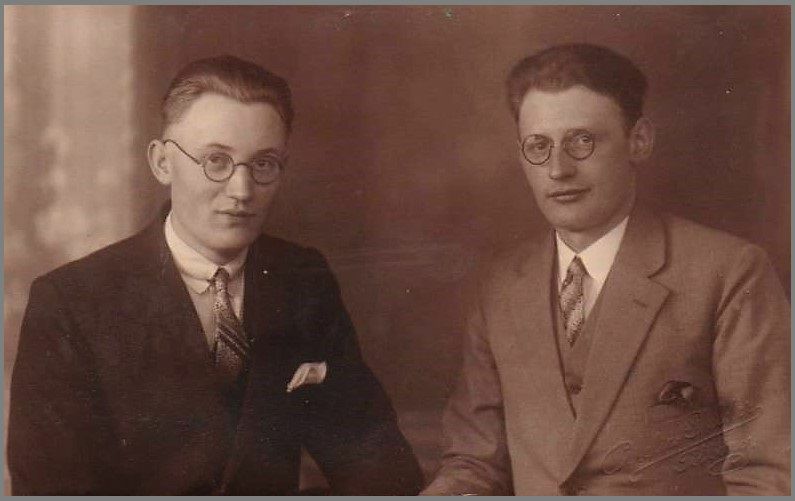 Ruurd Vogelzang and Johannes (Joe) Vogelzang, about 1925. 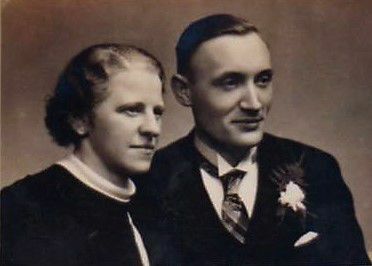 Engagement picture of Johannes Vogelzang and Johanna Kropman, Apr 14, 1929. 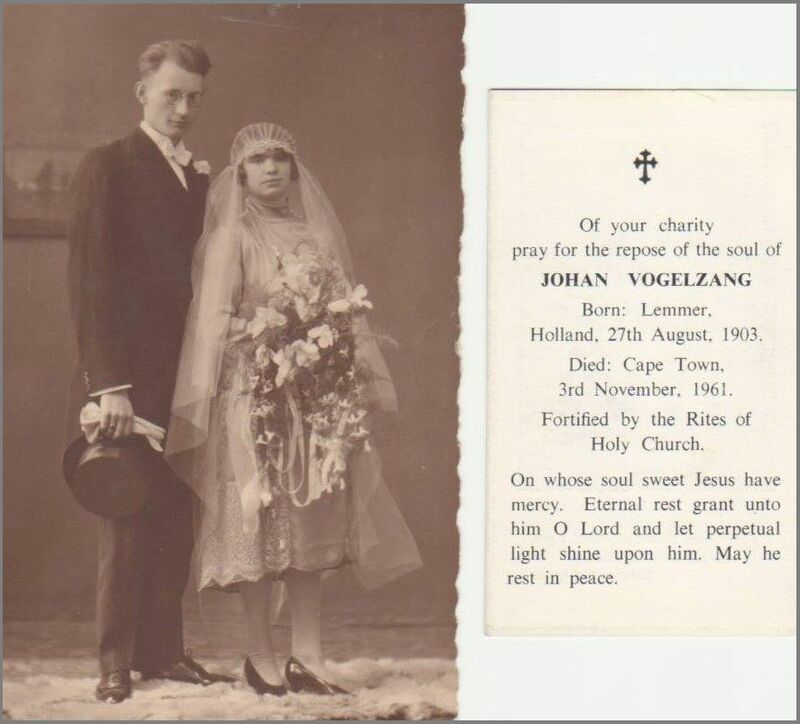 Wedding picture of Johannes Vogelzang and Prayer card of Johannes Johanna Kropman, Dec. 28, 1929 Vogelzang. 7. Engeline Vogelzang, born in Lemmer on July 3, 1905. She died in Peterborough General Hospital on Dec. 24, 1989 of Alzheimer’s disease. 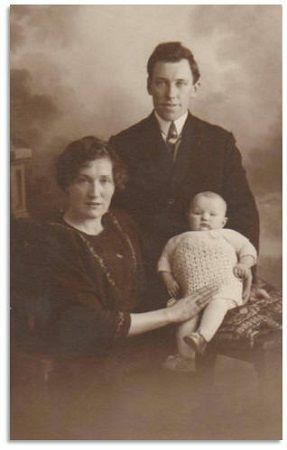 On May 11, 1933 she married Gijsbertus Kloosterman the son of Gerardus Kloosterman and Corrie Post. Gerardus was a small farmer in Diemen. 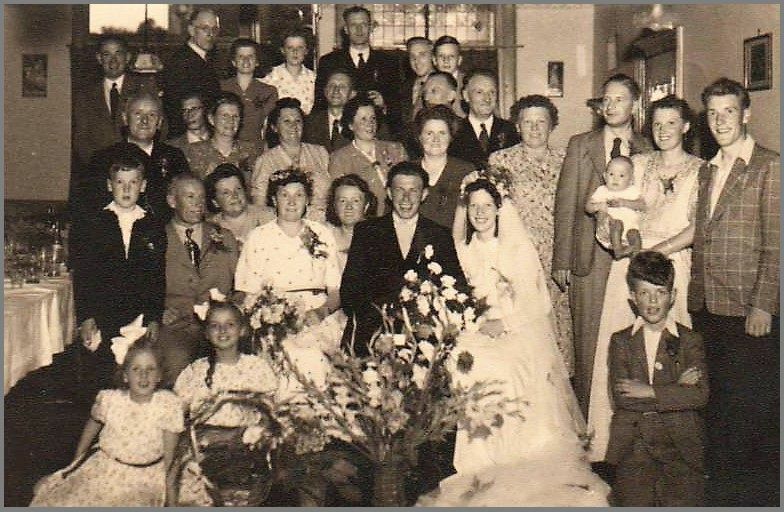 The marriage date was May 11, 1933 in Diemen RC Church. Gijs, was a friend of Lubertus Vogelzang, and thus was introduced to Engeline. Gijsbertus had a small taxi business and bicycle sales and repair shop in Diemen. He died on Jun 21, 1991 in Peterborough, Ont. Both of them are buried in the RC cemetery in Codrington, Ontario. They had five children. 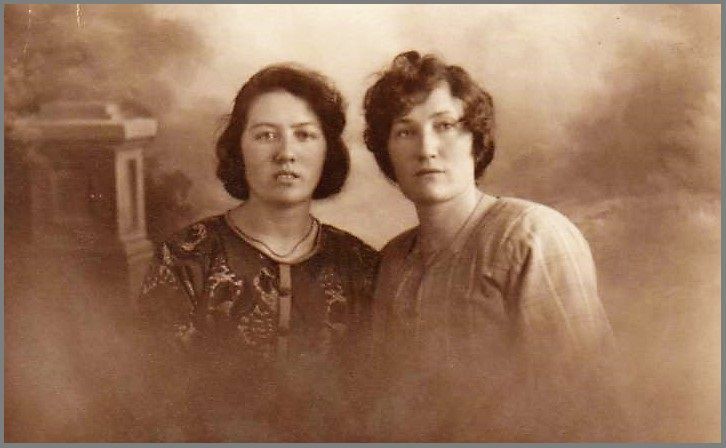 Engeline Vogelzang and her sister Agatha- ca 1920. Wedding Picture of Gijs Kloosterman Kloosterman. 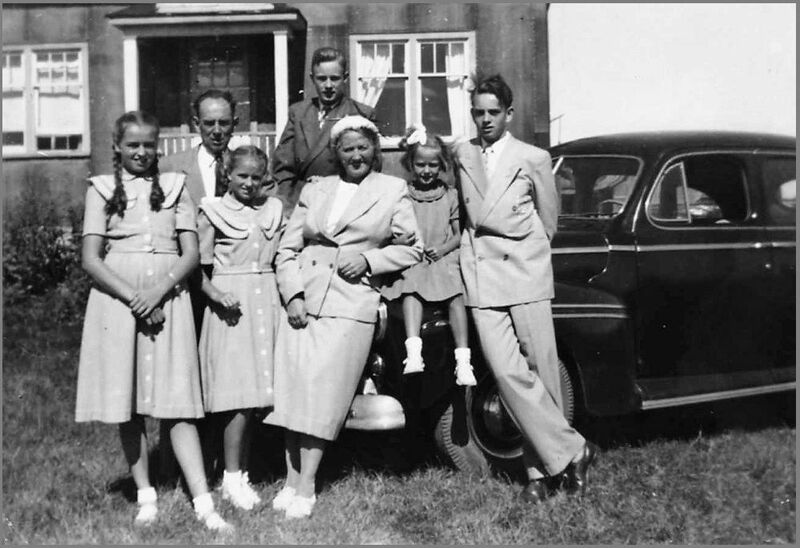 & kids fall 1939 and Engeline Vogelzang May 11, 1933 l to r Gerard, Corrie, Jan.
Engeline in 1940’s & Kloosterman family just prior to leaving for Canada, l to r fron row: Rennie and Angela. Back row l to r Jan, Gijs, Engeline, Corrie, and Gerard. They sold their Diemen business and moved to Canada. On Jun 22, 1952 they arrived in Halifax at Pier 21 on the MS Rijndam of the Holland America Line. In Halifax they boarded the immigrant train. It was powered with an old steam engine which pulled the passenger cars furnished with wooden benches without padding. Their destination was Colborne, Ontario, a 30 hour ride. It was warm and the windows of the train were open allowing the dirty smoke from the engine to enter the compartment, doing wonders to the cleanliness of the interior. Like so many immigrants, to be allowed to come to Canada, the Kloostermans had to agree to work on a farm. The farmer they were assigned to lived near Castleton, Ont. He picked the family up by taxi and took him to his place. However, on arriving there he showed them their “new” living quarters- an old dirty, run down, wooden farm house in which a pig would have been comfortable, but was quite a let down from what they were used in Holland. Their son Jan had been assigned to stay with the luggage left at the Colborne train station, as there was not enough room in the taxi to take the family and their belongings to the farm. When the taxi driver made the second trip from the station to bring Jan and the luggage, it was decided that there was no way they could stay on the farm and the Kloostermans asked the taxi driver for help. He was a kind man and understood the predicament the family was in. He drove them to a Dutch family living nearby. He was a share farmer for an absentee farm owner. The people were a God’s send. They were understanding and generous and gave them a chance to wash up after their tiresome long train journey. Mr. Wood told Gijs and his boys that General Motors in Oshawa, as well as Bata Shoe in Batawa, north of Trenton, could be hiring At the hotel they met a salesman who was going through Trenton and who offered Gijs and his boys a ride there. Once they got to Trenton they took the bus to Batawa where Gerry and Jan were hired on the spot to work on the assembly line. It was one week prior to the plant’s annual vacation. There were some Dutch people working on the same line as Gerry and he asked them if they knew of a place where the family could stay. However, when they heard that the Kloostermans were Roman Catholics, the old antagonism between Protestants and RC’s common in Holland during the pre-war years, came out and they refused to help. Nobody from their background, even the minister, would lift a finger to help them find accommodation. There were, however, some Dutch people originally from the Southern part of Holland and also with a RC background who also worked at Bata Shoe who helped out. One family, the Martin Valk’s, took on Gerry and Corrie, and the Bastiaan’s took in the remainder of the family. It is funny how small the world is sometimes. When Jan Kloosterman was still in Holland, he for a while helped a farmer, by the name of Eigenaar. In the process he got to know quite a few farmers, one which was a chap by the name of Bill Brak. One day when John was picking up his mail at the Batawa post office, lo and behold, he sees Bill Brak who also had emigrated and had bought a farm just outside of Batawa. Gijs Kloosterman made contact with Bill and he offered the family two large rooms in his large farm house. He also told Gijs that the Frankford Dairy, which was owned by the Moran family, was looking for a helper and Gijs started to work there the following week. Bill Brak had a bicycle which he loaned to Gijs so Gijs had transportation peddling back and forth to the job. Gerry during that week was on “unpaid vacation” from Bata. Hence he went with his Dad to the Dairy and helped in the translating of the English in order that Gijs could familiarize himself with the job. It did not take him very long to catch on. The second week of Gerry’s vacation he was asked if he could help picking up the milk cans from the farmers early in the morning, for processing at the dairy. The dairy’s owners, had not bothered to provide Gerry with any remuneration while he was helping there during his forced holidays. Hence he returned to Bata Shoe when they re opened after the holidays. Gijs worked at the dairy for quite some time. However, the owner’s daughter got married to a chap who also worked at Bata Shoe. They wanted him to get involved in the family business. Hence Gijs got the sack. 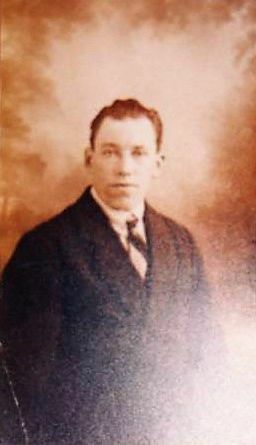 Gijs then went to work at the Riverside Dairy in Trenton, which was owned by a German family. They were still delivering milk door to door using a horse and buggy. This dairy eventually moved to Belleville and became Reid’s Dairy. After working for the Riverside Dairy for about a month, Gijs was offered a job in the machine shop at Bata Engineering which he took. Immediately after he took that job, however, the Frankford Dairy’s owners found that the new son in law did not work out all that well and they pleaded for Gijs to return. Since Gijs was making more money at Bata, he declined. They had been able to buy a car by that time and found it easier to all go to work at Bata’s in the same vehicle. The family stayed at Brak’s for about 6 months till they were able to rent a little house on Highway 33 near Frankford and along the Trent River. It had no running water or inside plumbing facilities, but it was home. L to r. Corrie; Gijs; Rennie; Jan; Engeline; Angela and Gerard – 1952. 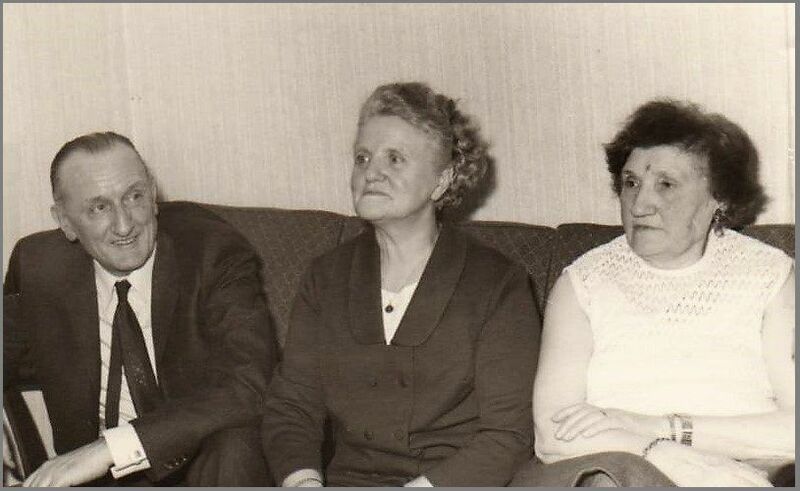 In May 1954 a 50 acre older farm with a small frame house and barn, located on the hills north of Frankford and behind Batawa and owned by Anton Goods came up for sale and they bought it for the grand sum of $ 2,250. The location was a lovely spot with a wonderful view. It was a joy to wake up in the morning and see the low clouds hanging in the nearby valley which was part of the farm. It was this place where the author first stayed when first coming to Canada. With hard work, and by being frugal, the family was able to save some money. Hence, Gerry and his Dad bought another older 155 farm between Frankford and Wooler along the Trent River and belonging to Lorne Mikel. They paid $20,000 for it- a far cry from its current value for a farm with river frontage. 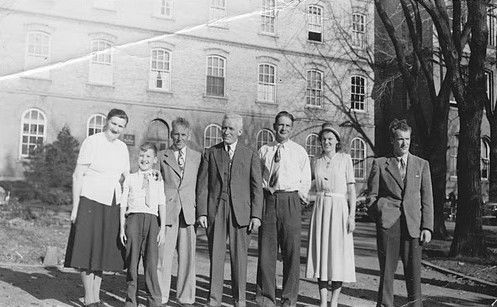 Kloosterman family in Frankford ca 1954- l t r Engeline; Gijs; Rennie; Angela; Jan; Corrie; Gerard. 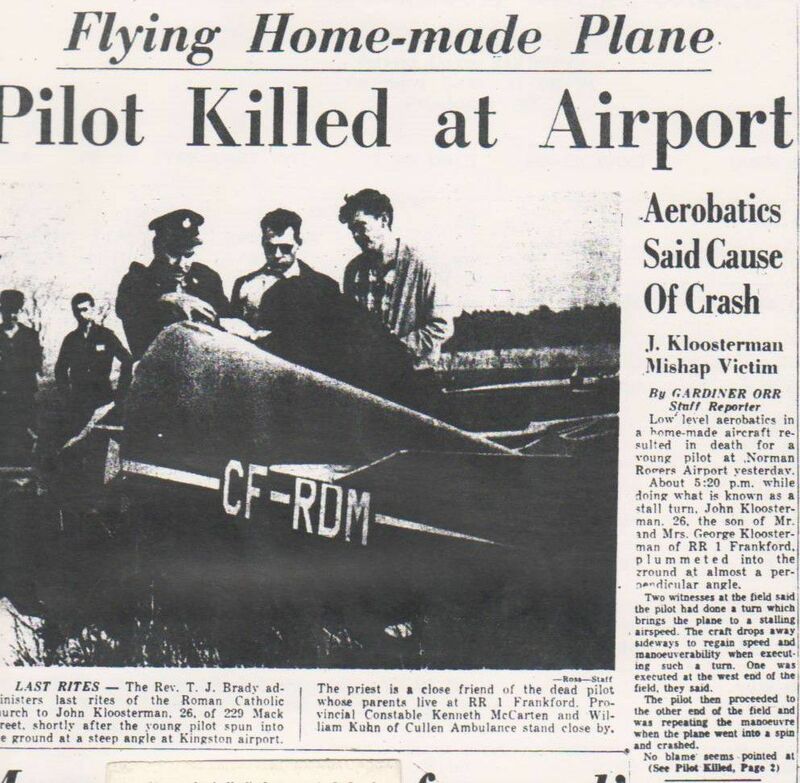 On April 30, 1962, tragedy struck the family when their second son Jan crashed a home made plane on the Norman Rogers airport in Kingston, Ontario. Jan at t he time worked for Dupont in the accounting office. He wanted to become a commercial pilot and spent most of his time at the airport rubbing shoulders with other flyers, and trying to get as many hours in as possible to qualify for his commercial licence. One of his friends had built a home made plane and it needed to be test flown to get its proper certification. Jan offered to help in this. On the day in question he took off from the run way. Probably he banked too fast and the plane stalled crashing nose down into the runway, killing him instantly. Aunt Engeline was just discharged from the hospital from what was to be a thyroid operation. However, when she got a general physical prior to the intended operation, a lump was found in her breast and a mastectomy was done. The death of her son devastated her. Jan was a good looking tall chap- having the Vogelzang genes. She never got over his death. Following retirement of Gijs, the farm was sold and the family moved to Peterborough. Gerry did not want to stay at the farm, as he had a steady job as scheduler and cost calculator at Batawa. Corrie had got married to Bill van der Ven who had obtained a job in Peterborough, and daughter Angela also had moved to Peterborough to marry a chap who worked at a factory there. Hence Peterborough was the logical place to live. They bought a house there and they were happy there. Unfortunately Engeline developed Altzheimers and the circulation in Gijs’ legs got bad resulting in the eventual loss of both of them. Engeline died Dec 24, 1988 of diabetes and pneumonia. Gijs, once he lost his legs, could no longer look after himself and took up residence in the Applewood retirement residence, where he died suddenly of a ruptured aneurysm on June 21, 1991. 8. Lubertus Vogelzang, born in Lemmer Dec. 22, 1906 and died in Amsterdam on Aug. 7, 1978. 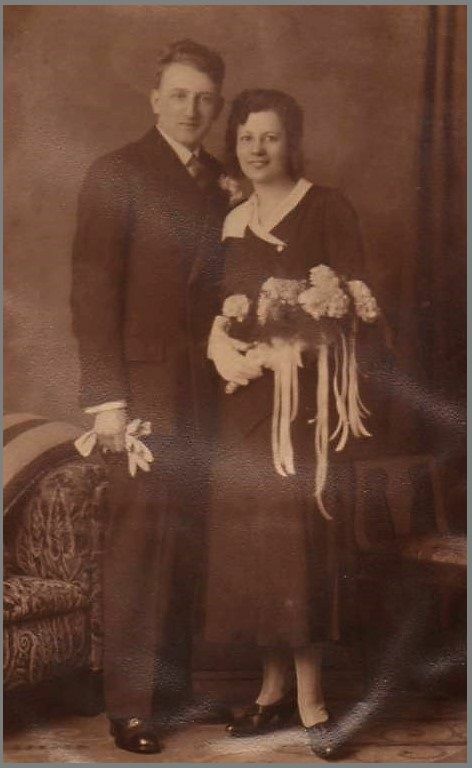 On May 4, 1932 he married Aleida (Leida) Peelen, in the St Nicholaas-Barbara RC church in Amsterdam. She was born on Oct. 7, 1905 in Amsterdam and died there on Jan. 31, 1963 leaving four children, the last one of which was only eleven years old. On Jun 17, 1965 Lubertus remarried to Johanna van der Bosch. Lubertus was a foreman at the Amsterdam Dry Docks overseeing repairs to sea vessels. He died of senility. Following the death of his first wife the younger children lived with the older ones. 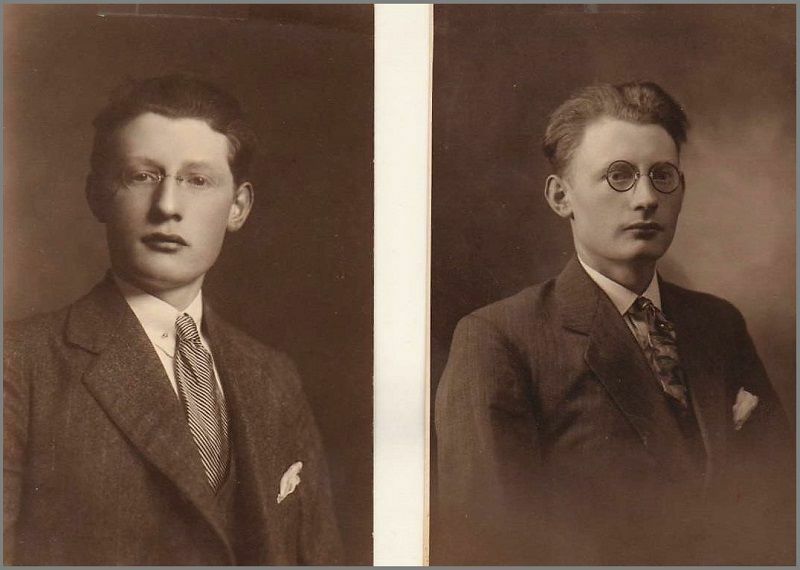 Lubbertus Vogelzang on left about 1927 on right about 1930. 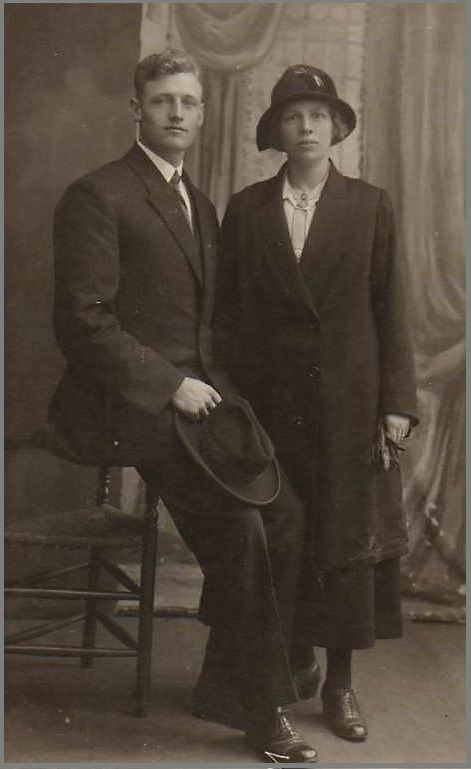 Wedding Picture of Lubbertus Vogelzang and Aleida Peelen. May 4, 1931. Lubertus Vogelzang, Elizabeth Vogelzang-Ringeling and Agatha Vogelzang-Deden, 1970. Wedding picture of Ruurd Vogelzang and Henny van Beek. 9.Ruurd Vogelzang, born in Lemmer May 29, 1909 and died in Eindhoven in 1994 as the result of being hit by a car while riding his bicycle. 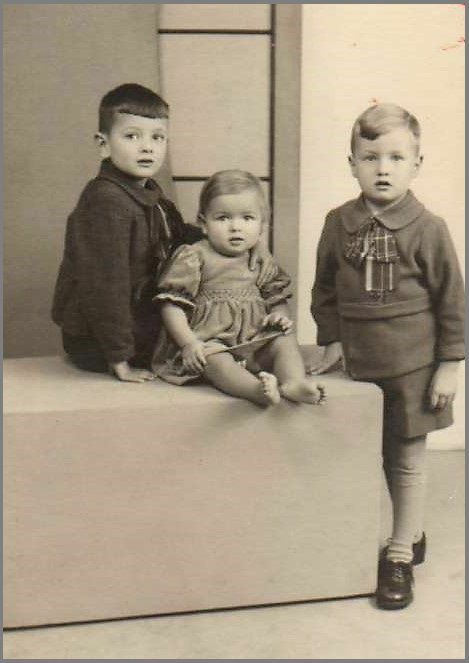 On Feb. 22, 1938 he married in Antwerp, Belgium Hendrika (Henny) van der Sommen-nee van Beek. She was the widow of Thomas van der Sommen who was born in Utrecht on Oct. 8, 1926. He died on Dec 7, 1933 and was a merchant. That couple had two children. The second marriage produced four additional ones. Ruurd was a radio technician for Philips Electronics in Eindhoven. Henny had a few bucks and provided the capital to start an electronics store in Eindhoven called “Radio Vogelzang” When the sons from Henny’s first marriage became of age, they started additional stores in Heerlen and Maastricht, and thus they become a rather successful chain, even having their own credit cards. Unfortunately, with the rise of cheap Asian electronics, the firm could not compete resulting that the firm went bankrupt in the early 2000’s. Sic transit gloria mundi.